An exhibition of new work by the influential Indian artist Balraj Khanna will be on display in a public gallery for the first time at Jerwood Gallery this spring. In Parallel Lives, Plutarch wrote “It is no great wonder if in long process of time, while fortune takes her course hither and thither, numerous coincidences should spontaneously occur.”Arguably, this philosophical construct can be applied to the life and career of Balraj Khanna. After graduating in English Literature from the University of Chandigarh, in his native Punjab state, Khanna came to Britain in 1962 to study for a degreeat Oxford University. However, due to the disorder created by the Indo-Chinese war, the necessary documentation from India never arrived, denying him his place. Unfazed, he saw this as an opportunity to pursue his fascination with painting, and established himself in swinging Sixties London. It was also during this time that Khanna met fellow painters Francis Souza and Avinash Chandra. It was through them that he was introduced to the British art scene and, after selling his first painting for the princely sum of £10, his first exhibition was at the Vision Centre, run by the critics Denis Bowen and Kenneth Count-Smith. Entirely self-taught as an artist, Khanna developed a highly original painting style, and was quickly recognised as being an exciting and significant artist, not least by the renowned writer Richard Cork. Khanna went on to have major exhibitions at Bristol City Art Gallery, De La Warr Pavilion, and was included in group shows at Hayward Gallery, Serpentine and Tate Britain. Today, his work is held in major collections and has been exhibited around the world. 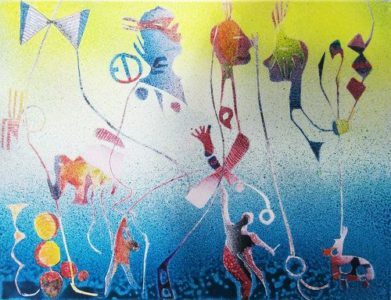 Through much of his career, Khanna had developed a reputation for producing large format works – exemplified by the 13 meters by 8 metres (42ft by 26ft) safety curtain he created for the Birmingham Hippodrome in 2001, which is the largest piece of public art in the UK. However, a terrible motorcycle accident in 1969 would have repercussions in his later life. Extreme pain in his back has, more recently, required him to change his style. Thus, The Great Wall of Small is Beautiful is a first for the Hastings gallery. Virtually all of Khanna’s new, jewel-like paintings will be on display together for the very first time. Another first for the gallery is the fact that Balraj Khanna: The Great Wall of Smallis Beautifulis its maiden exhibition by an Indian artist. “Khanna draws on his childhood and youth in the Punjab, so there’s both a real-life playfulness combined with his imagination. Visitors will see cosmic and deep-sea themes and I expect that children will love the bright colours he uses. Khanna is renowned for his strong use of blue, yellow and red,” says Jerwood Gallery Director, Liz Gilmore.